More than 500 religious scenes are depicted on the walls of this masterpiece. Yaroslavl. Church of St. John Chrysostom at Korovniki. Interior. West piers and central dome. Aug. 15, 2017. Logistical support for Prokudin-Gorsky’s project came from the Ministry of Transportation, which facilitated his photography on Russia’s waterways and expanding rail network. His trips along the Volga River included the city of Yaroslavl, 150 miles northeast of Moscow. Yaroslavl, which today is an industrial center with some 650,000 inhabitants, has one of Russia’s richest concentrations of church art and architecture from the 16th through the 19th centuries. Prokudin-Gorsky photographed there in the summers of 1910 and 1911. My work in Yaroslavl has extended for three decades, from 1987 to 2017. Church of St. John Chrysostom at Korovniki. Northwest view. North wall (left) with frescoes on the interior. June 29, 1995. Founded in the early 11th century by Yaroslav the Wise, Grand Prince of Kievan Rus, the settlement had masonry churches within its monasteries by the early 13th century — a time when most buildings were of logs. In 1238, the town was sacked by the Mongols during their conquest of central Russia. Yaroslavl united with the expanding Muscovite state in the 15th century, which integrated the town into a large political and economic structure. By the 17th century, Yaroslavl was a center for trade within the vast Volga River basin as well as to Siberia, the Russian north and western Europe via the White Sea. It attracted colonies of Russian and foreign merchants — from England, the Netherlands and Germany. Church of St. John Chrysostom at Korovniki. Northwest pier. 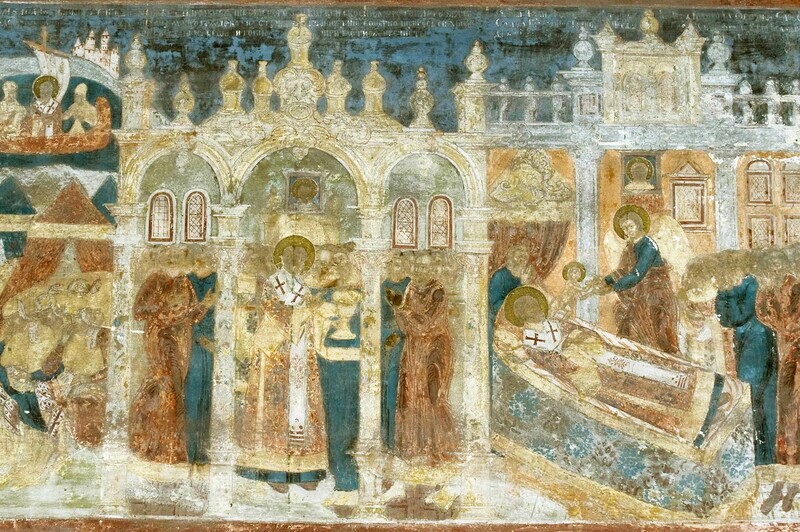 Left: Tolg Icon of the Virgin; fresco: Decapitation of Dionysius the Areopagite. Right fresco: Crucifixion of Apostle Simon the Zealot. Summer 1911. Yaroslavl’s commerce declined during the interregnum following the death of Boris Godunov in 1605. Known as the Time of Troubles, this period saw much of the country devastated by political and social chaos. Yaroslavl avoided the worst of the cataclysm, and in 1612 it served as a center for national forces against a Polish occupying force in Moscow. The participation of Yaroslavl's leading merchants in this campaign brought them trading privileges from the government of the new ruler, Mikhail Fyodorovich (1596-1645), first tsar of the Romanov dynasty. Only Moscow could rival Yaroslavl in its concentration of new churches, sponsored by prosperous merchants, city districts, and trade associations. During the 17th century, the area’s 35 parishes witnessed the construction of 44 masonry churches, most erected after a fire that consumed much of the town in 1658. Church of St. John Chrysostom at Korovniki. Northwest pier. Icons missing from pier base&icon screen in the background. Aug. 15, 2017. The skill of Yaroslavl's builders in forming church ensembles is most impressively demonstrated at Korovniki, a district on the city outskirts near the confluence of the small Kotorosl River with the Volga. The area takes its name from the Russian word korova (cow) and was used as pasturage. Its inhabitants also engaged in ceramic crafts, brick-making, and pottery, all of which play a major role in the structure and decoration of this ensemble of two churches, with a large bell tower situated between them on the west. Prokudin-Gorsky took a superb view of the ensemble from the northwest. The main structure of the Korovniki ensemble is the Church of St. John Chrysostom, commissioned by the merchants Ivan and Fyodor Nezhdanov, who are buried in its south gallery. Constructed in 1649-1654, the church was remodeled with more elaborate decoration in the 1680s and thus represents an amalgam of two periods. 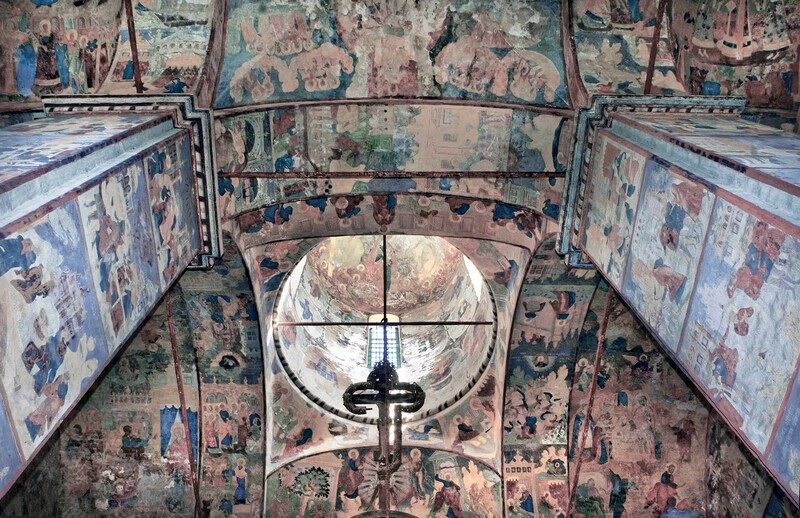 Although damaged during the Soviet period, the interior contains some of the best examples of Yaroslavl fresco painting. 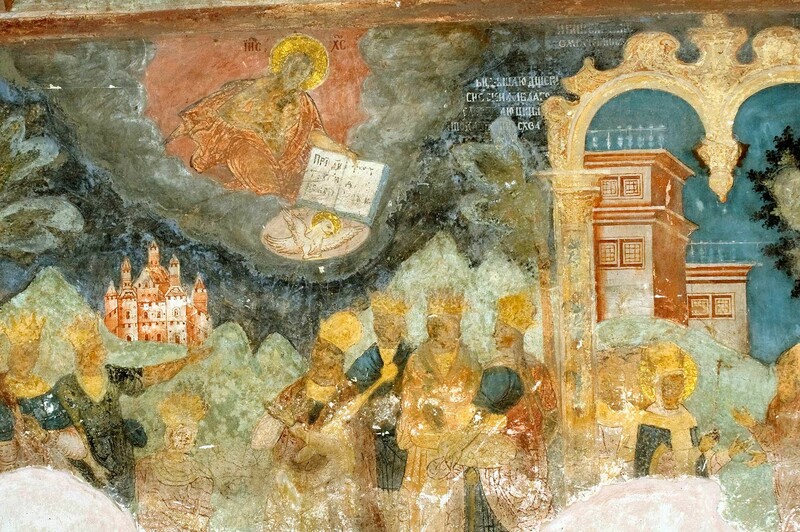 An inscription in the altar space states that the frescoes were painted in 1732 and 1733 by a group of painters under the direction of Alexei Ivanov. Retouched with distemper paints in the mid-19th century, the surviving frescoes were cleaned and restored in the 1960s. 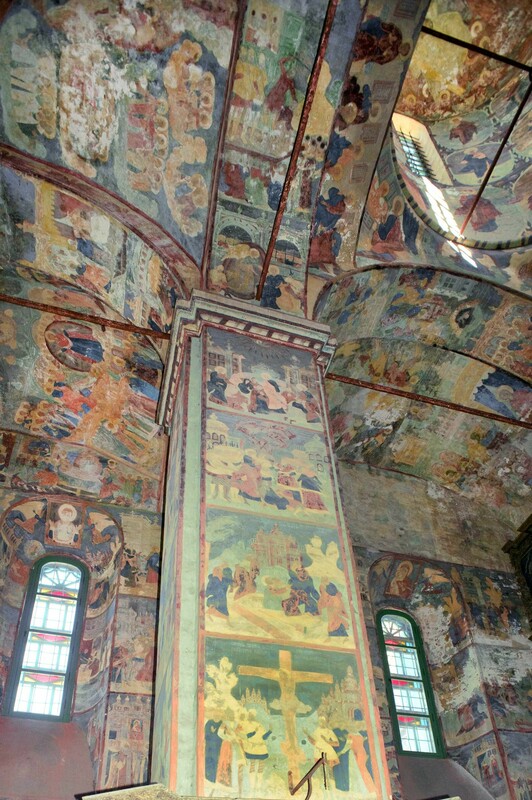 Rivaling the Church of John the Baptist at Tolchkovo, the Korovniki interior contained some 500 scenes throughout its interior, including the galleries. The high walls are divided into eight rows, or registers. The two bottom rows consist of an ornamental strip of floral garlands and a decorative towel motif (partially effaced). The third and fourth rows display 80 scenes from the life of St. John Chrysostom (ca. 349-407), Archbishop of Constantinople and a renowned preacher in the early Christian church. (The sobriquet “Chrysostom” — “golden tongue” — refers to his eloquence.) The fifth register depicts scenes from the life of Mary. The sixth and seventh rows depict scenes from the life of Christ. The ceiling vaults portray major festivals such as the Annunciation, the Ascension, the Nativity of Christ, the Resurrection, the Elevation of the True Cross, the Purification, the Nativity of the Virgin and the Intercession of the Virgin. Although only dim fragments remain, the central west ceiling vault portrayed the scene known as “Wisdom Has Built her House,” with Christ on the Cross in the center. Church of St. John Chrysostom at Korovniki. Northwest corner. North wall with frescoes of St. John Chrysostom. Summer 1911. Instead of the usual depiction of Christ Pantocrator, the central cupola portrays Mary surrounded by archangels. The ceiling vaults and the central cupola rest on four massive piers. Only the west piers are visible; the east pair is behind the tall icon screen, erected at the turn of the 18th century. The frescoes on the piers are devoted entirely to the Acts of the Apostles. Fortunately, two of Prokudin-Gorsky’s original glass negatives taken on the interior have survived in the Library of Congress collection. The first view shows the lower part of the massive northwest pier. The pier’s west face (left) contains a fresco of the decapitation of St, Dionysius the Areopagite, a judge converted to Christianity by St. Paul and subsequently the first Bishop of Athens. Partially visible in the fresco above is Apostle Bartholomew, tied head down on a cross in preparation for his martyrdom by flaying. Below is large icon known as the Tolg Virgin, depicting Mary with the Christ Child and flanked by elaborate Baroque columns in the grapevine form. The icons were removed for museum collections during the Soviet period, as my 2017 photographs show. The pier’s south face has a fresco of the Crucifixion of Apostle Simon the Zealot. 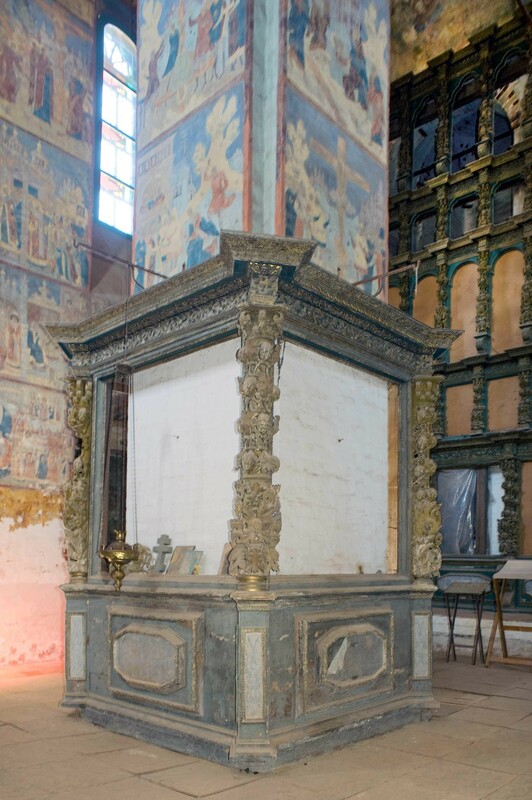 (The Roman Catholic Church considers that he was martyred by being sawn in two.) Below is an expansive icon entitled “The Ministry of the Apostles,” whose circular form centers on a figure of Christ framed in silver. 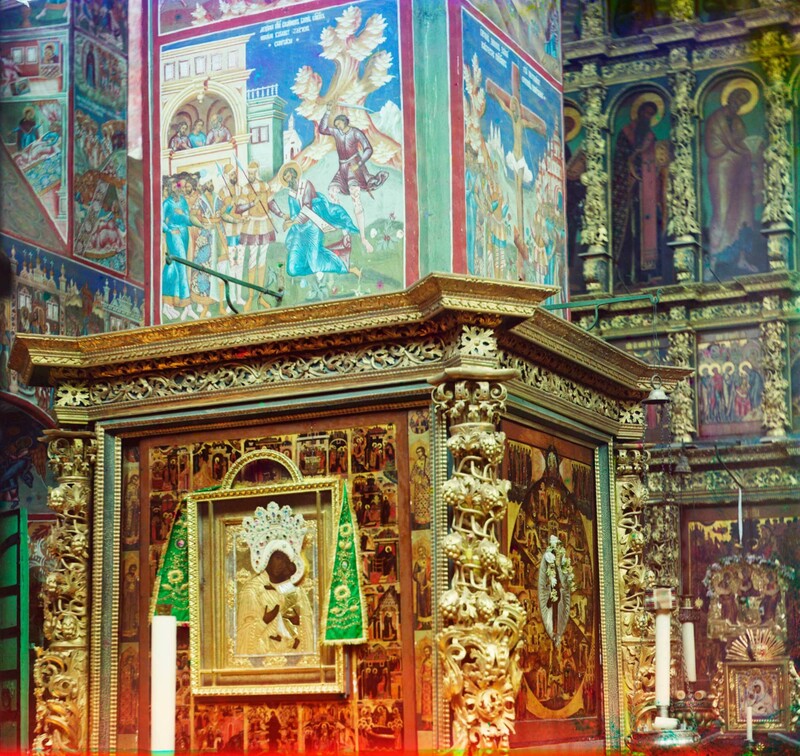 In the background are details of the Local, Festival and Deesis rows of the great Baroque icon screen. Again, my photographs show the icons missing. Church of St. John Chrysostom at Korovniki. 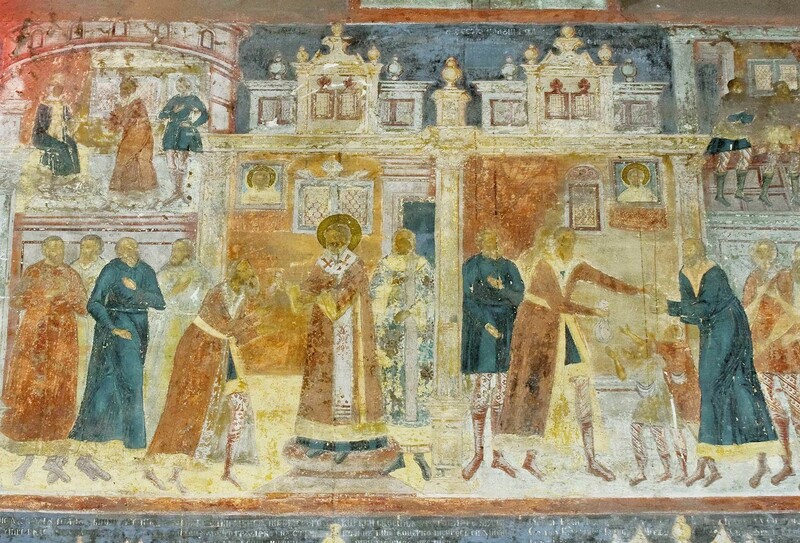 North wall frescoes include St. John Chrysostom giving money to his treasurer to be dispensed as alms to the needy in Constantinople. Aug. 15, 2017. The second Prokudin-Gorsky photograph encompasses the lower levels of the north wall at the northwest corner. 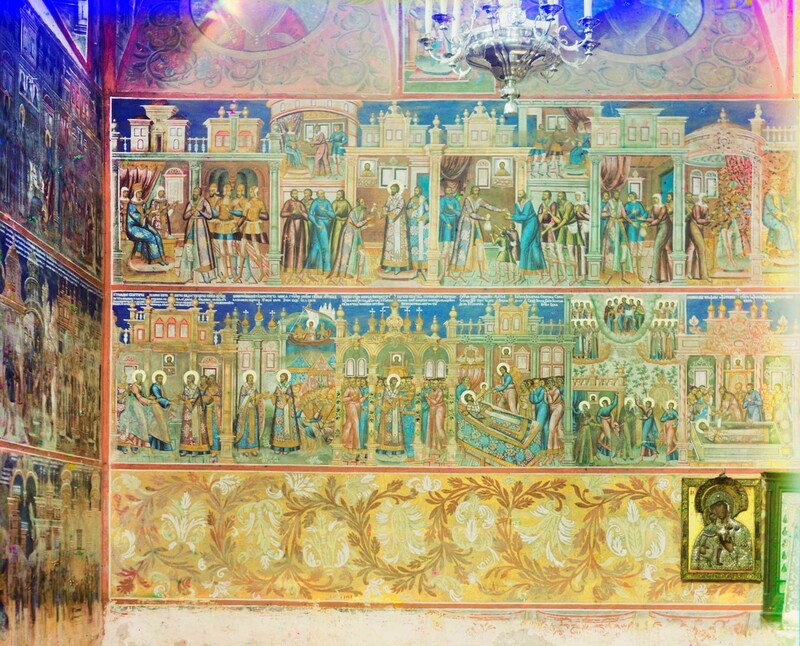 The upper rows depict scenes from the life of St. John Chrysostom, including his exile and deathbed, with an angel carrying his departing soul (center of lower row). Old Testament prophets are depicted within medallions in the window embrasures above. In the shadows on the left are frescoes on the north side of the west wall. 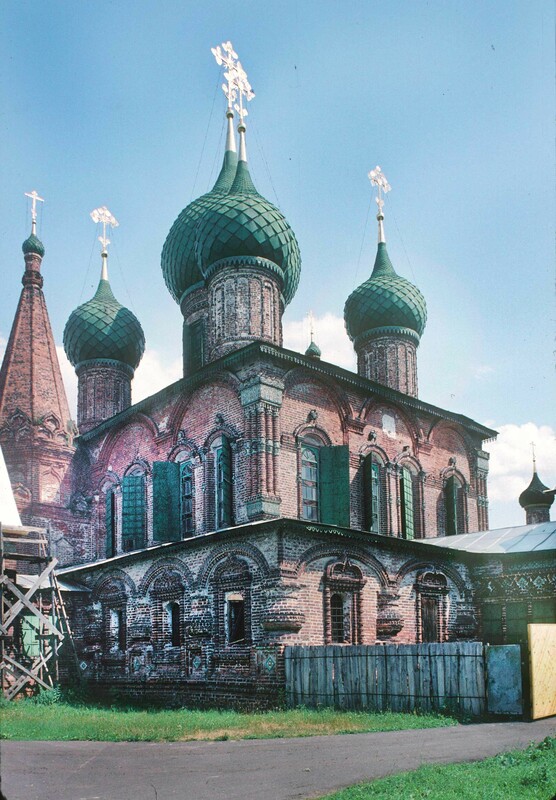 In 1992, the St. John Church was transferred by city authorities to the local Old Believer Orthodox community. Careful preservation work with these richly colored frescoes continues on the south and west walls. Access to the church can be arranged by agreement with the parish priest. Church of St. John Chrysostom at Korovniki. 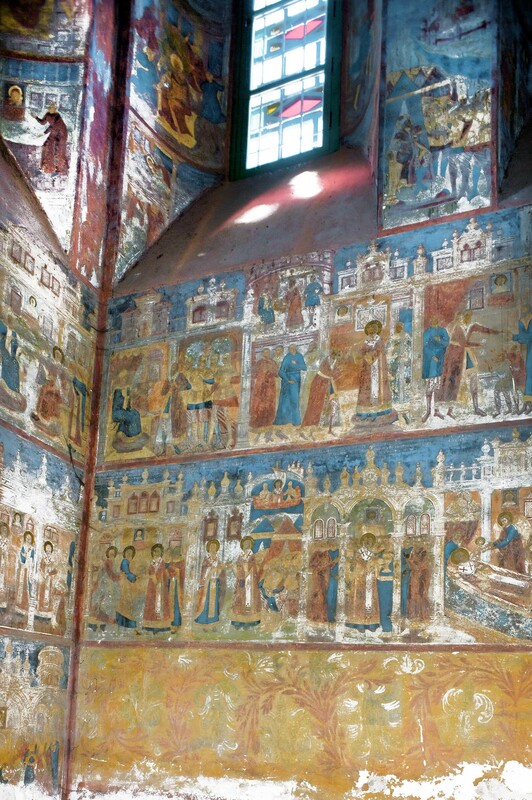 West wall frescoes include Byzantine court whose luxury was excoriated by St. John Chrysostom. Red cloud contains image of Christ looming over crowned figures at palace. Aug. 15, 2017.